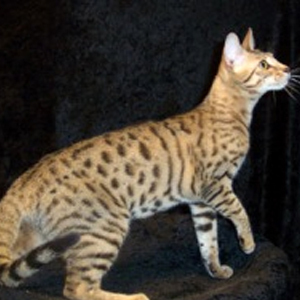 The breed is still in the development stages, but the ultimate aim is to produce a cat that looks similar to a Serval, without using any recent wild cat blood. (Bengal cats originate from hybridization of Asian Leopard Cats. Most Bengal cats used in Serengeti programs are many generations removed from these origins and possess few genetic contributions of the Leopard Cat). Serengeti cats are spotted cats, with long legs and very large ears. Males are generally slightly larger and heavier than females and can weigh up to 15lbs; females generally weigh between 8 and 12lbs. They are recognised by TICA (The International Cat Association) in tabby, ebony silver, ebony smoke and solid black. A group of breeders in the UK are currently working towards getting TICA to also recognise the snow spotted (aka lynx-point) variety.